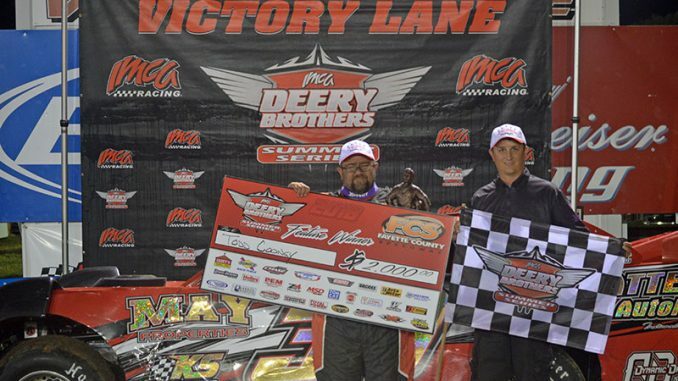 WEST UNION, Iowa (July 25) – Todd Cooney had his car loaded up and ready to go home, think­ing the rain that delayed Wednesday’s Deery Brothers Summer Series program at Fayette County Speedway would ultimately lead to its cancellation. 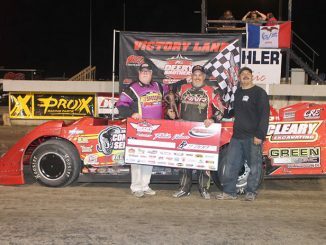 But the rain went away, the speedway crew got the oval back in prime shape and Cooney ulti­mately ended up going home with the IMCA Late Model tour victory and $2,000. After running everywhere from third to seventh, Cooney passed Justin Kay and leader Chad Hol­laday on the 31st of 40 circuits. He beat Kay to the checkers by about a car length for his career eighth Deery win. Tyler Bruening made his way from the last starting spot to end in third. Holladay, coming off the win the previous Wednesday at Columbus Junction, and Darrel DeFrance completed the top five. Cooney had run fifth in his one previous Deery outing at West Union, in 1996. The Fayette County Fair show was the first tour event held there in nine years. Tim Simpson was the $250 Sunoco Race Fuels feature qualifier drawing winner. The late John Deery Sr., founder of the series title sponsor Deery Brothers Automotive Group, was remembered with a moment of silence before the evening’s race program. Services for Deery were held Monday in Cedar Falls. 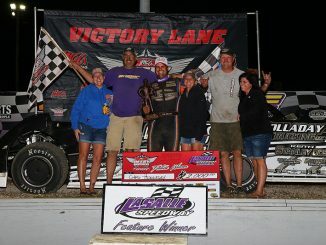 Next up for the series is the $2,000 to win event on Saturday, Aug. 4 during the Illinois Valley IMCA Showdown at LaSalle Speedway. Feature results – 1. Todd Cooney, Pleasant Hill; 2. Justin Kay, Wheatland; 3. Tyler Bruening, Decorah; 4. Chad Holladay, Muscatine; 5. Darrel DeFrance, Marshalltown; 6. Richie Gustin, Gil­man; 7. Curt Martin, Independence; 8. Darren Ackerman, Elk Run Heights; 9. Ryan Dolan, Lis­bon; 10. Luke Goedert, Guttenberg; 11. Cayden Carter, Oskaloosa; 12. Jeremiah Hurst, Dubu­que; 13. Tim Simpson, Iowa City; 14. Denny Eckrich, Tiffin; 15. Nick Marolf, Moscow; 16. Joe Zrost­lik, Long Grove; 17. Curt Schroeder, Newton; 18. Greg Kastli, Waterloo; 19. Travis Smock, Independence; 20. Andy Eckrich, Oxford; 21. Rob Moss, Iowa City; 22. Chad Coyne, Orion, Ill.; 23. Jeff Aikey, Cedar Falls; 24. Logan Duffy, Independence; 25. Bryce Carey, Nashua.